The following is a guest post by Al in Vancouver... enjoy! 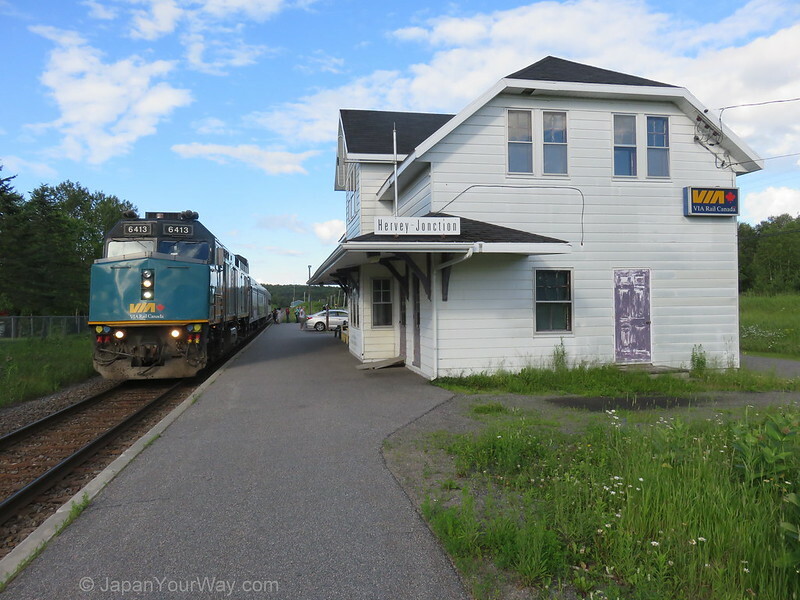 In June and July of 2017, I had the opportunity to ride three passenger trains in northern Québec. This guest post will focus on overall impressions and tips for railfans. This passenger service is operated by Tshiuetin Rail Transportation, owned by three first Nations in the region. The head end crew and track between Sept-Îles and Emeril, Labrador are provided by the QNS and L Railway, a wholly owned subsidiary of the Iron Ore Company of Canada. The train operates twice weekly. As tickets are non-refundable and the person at the phone number listed on the website told me the train is never full, I decided to buy my ticket at the station in Sept-Îles the morning of departure. I was surprised to learn they only accept cash (no credit or debit cards) at the station in Sept-Îles. There is no ATM at the station. After all passengers with tickets were boarded, I was allowed to buy my ticket and board. Photo ID is required at boarding. Seating is first come, first served. I was surprised at the length of the train: Two locos (TSH 7205, 601), baggage generator TSH 1423, four baggage (TSH 1422, 1401, 1455, 1445), cafeteria TSH 1000, three older coaches (TSN 1002, 1004, 1005) and two newer coaches (TSH 13518 and 13517). I was directed to sit in an older coach with red seats (TSH 1004) which was also equipped with a projector and screen suspended between the luggage racks to show movies. I sat far enough away from the movie equipment so that it would not obscure my view out the window. A Québec tour group (tour conducted en français) occupied the first newer coach while the trailing coach was kept for employee use. I estimate 50 to 60% of the seats were occupied. None of the windows on the train were clean; disappointing as this affected the view. Even if they were clean, I believe the age of the windows would still diminish the view. Fortunately a photographer with the tour group was given supervised access to open the vestibule windows, and I was able to use this for photos soon after we left Sept-Îles. The interior of the train was kept quite clean. The first 100 miles north from Sept-Îles pass through beautiful scenery as the route climbs along the Moisie River. Sit on the left (west side) of the train for the best view. We had a few meets with QNSL iron ore and work trains. Speeds are generally between 30 to 40 mph. 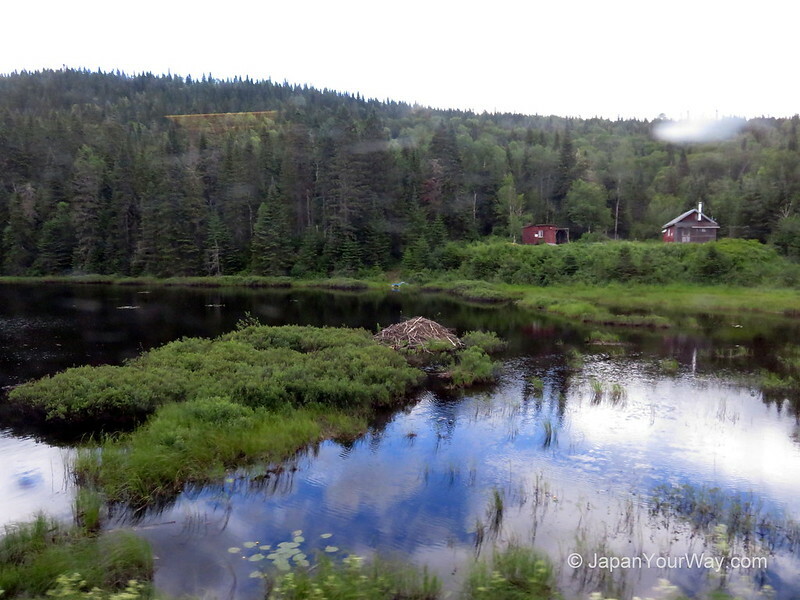 It is interesting to watch the changes in scenery as the train climbs the Canadian Shield and gains latitude north through Labrador. While the track is in good condition south of Emeril, there are sections north of Emeril that are rough and slow. We arrived Schefferville around 20:30. I did not have accommodation reserved but managed to arrange a clean, quiet and efficient room for $75 at a facility for workers named Bloc Orange. From what I saw of the conventional motels, it is easy to pay over $200. There is no road access to Schefferville, so things are expensive. Your mobile phone will not work for voice or data unless you get a local SIM card. Also note that WiFi gets very congested during the evenings due to high usage over limited bandwidth. The road between the town of Schefferville and the train station is gravel. If you decide to walk like I did, there is a good chance someone will stop and offer you a ride! There is a taxi service in Schefferville, but there was a long wait once the train arrived. I was also told the taxi is not open in time for the morning southbound departure. The southbound trip the following morning was on the same equipment, except that locomotives TSH 601 and 701 were leading. The station at Schefferville accepts credit and debit cards for tickets. Again, photo ID is required at boarding. There was no tour group southbound and both of the newer coaches were kept for employee use. We arrived Sept-Îles around 22:00. The train was turned prior to the station stop. Apparently it is not unusual for the train to arrive hours late due to meets and slow orders. There is a good thread about the train on trainorders.com and a CBC documentary on YouTube. VIA Rail operates this train, as well as the Jonquière train described below, over CN tracks. Each train is operated with a single F40PH-2 loco, one 8600 series baggage car and one HEP2 coach. They operate three times a week. Seat selection is not pre-assigned. Due to limitations in my schedule, I chose to do this trip one-way from Senneterre to Montreal. In retrospect, I would have done a return trip on this route, as the scenery is nice and because this train is always at the rear of the combined Senneterre and Jonquière train south of Hervey, providing access to a window facing out the rear of the train. Note that not much is open in Senneterre before the train departs (even for the later Sunday departure), so bring food with you or buy it on board. The scenery is interesting with lots of forest, lakes, rivers and some hills. As with the other routes, the northern portion of the route provides access to camps, cottages and settlements that do not have good road access. We were two hours late arriving Hervey due to meets and slow orders. We pulled into Hervey station for passengers, then reversed out to allow the train from Jonquière to get into the Hervey station ahead of us. 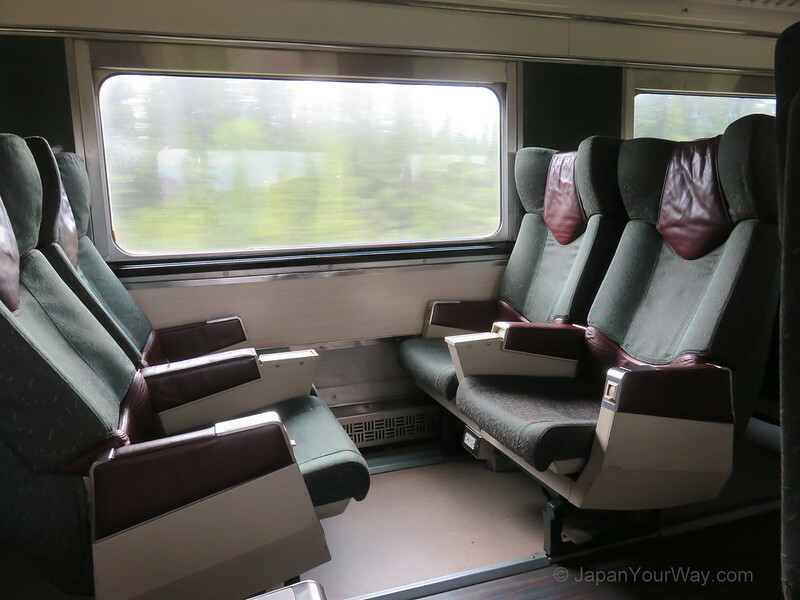 We then coupled to the rear of the train from Jonquière. 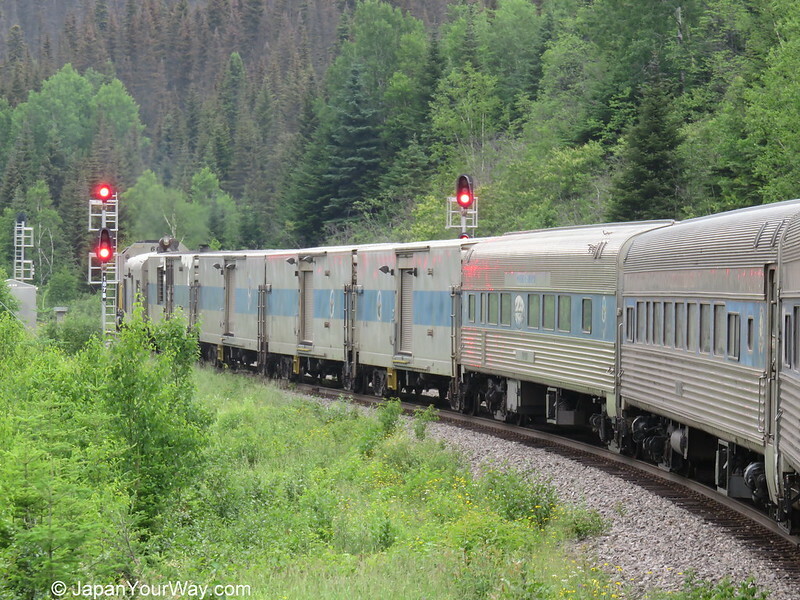 The route from Hervey to Montreal is similar to the route between Québec City and Montreal with lots of rich farmland and stretches with good track speed. There are some significant trestles on the Joliette subdivision (miles 50, 52, 58, 65 and 76), a tunnel at mile 51 and an interesting route through Shawinigan. 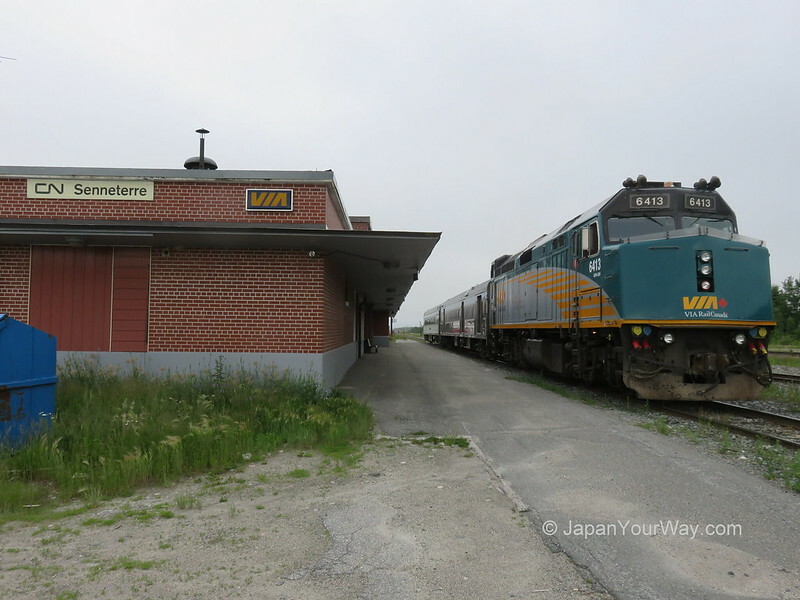 As we were still late approaching Montreal, the train stopped at Gare Sauvé for the crew to take a 20 minute rest break, allowing them to extend their operating day by 2 hours. 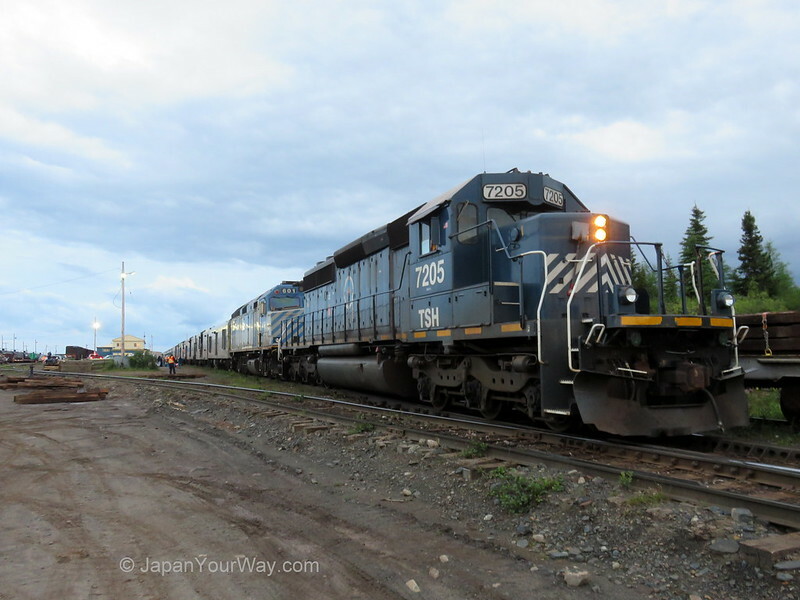 As the Jonquière train has a later start than the Senneterre train, the Jonquière crew is fresher and this is why the trains wait for each other in Hervey and are coupled with the Jonquière train and crew leading. By the time we arrived Gare Centrale in downtown Montreal, we were two and a half hours late. Note this train does not use the Mont Royal tunnel, so it takes a while to route through the yard at Saint-Luc. Most shops at Gare Centrale close at 21:00; fortunately a nearby Provigo supermarket was open til midnight. I noticed a brochure at Senneterre station describing (en français) an outing using the train from Senneterre to Press, with a re-enactment of the last spike ceremony at Press followed by brunch and return to Senneterre by bus. Remaining dates for 2017 are planned for August 6 and 20. Info is available by emailing cde@ville.senneterre.qc.ca or calling +1-819-737-2296 extension 221. The local tourist bureau can suggest activities in the region. They can be contacted by emailing tourisme@ville.senneterre.qc.ca or phoning +1-888-437-2694 or +1-819-737-2694. This train is assembled with the baggage car trailing the coach, i.e., locomotive followed by coach followed by baggage. 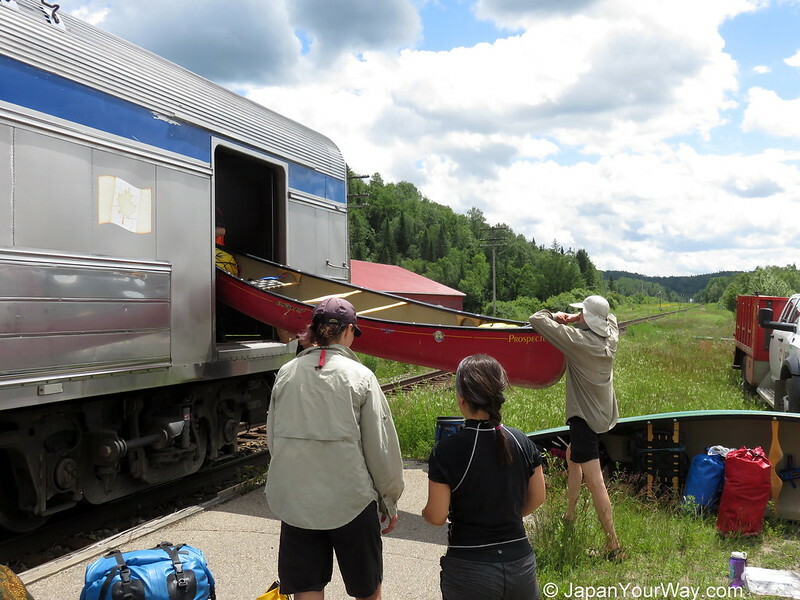 I was told this is to allow canoes to be loaded and unloaded using the rear door of the train from the baggage car. I didn't see this door being used, but I can imagine a stop on a banked curve or conditions at the side requiring rear access. Note that this arrangement prevents passengers from seeing out the rear of the train. Between Montreal and Hervey, the Senneterre train is coupled (elephant style) to the rear of the Jonquière train. For this portion of the route, please see my comments above. Northeast of Hervey, the route follows the appropriately named Rivière-à-Pierre upstream. The best views are on the north side of the train. Many cyclists used the train, and at times the coach was around 90% full. This is a very scenic region with infrastructure for tourists. There was some freight traffic on the line with a few meets. Forest product companies seem to be the primary customers. The descent into the Saguenay region provides some nice views (again, the best view are on the north side) of Lac Saint-Jean, which is huge! The terminus station in Jonquière is conveniently located at a transit hub, providing cheap transit options throughout the region. I stayed overnight approximately 10km away in Chicoutimi and used transit both ways. If you are a cyclist and not familiar with Québec's Route Verte and their 5000 km network of bike paths, check out this link. More info about taking bikes on VIA trains is on VIA's website. I thoroughly enjoyed all of these trains. Although it is difficult to rank them, I have to say the trip to and from Schefferville provided the most memorable experience. This is due to the different scenery and the QNS&L railway but also because most people operating and using the train were from First Nations. I suggest that if you take this train, try to get to know some of them (the seats in the cafeteria car provide a good place to do this). The person who picked me up on the way to the station in Schefferville made a lasting impression as he shared his background and stories with me. The farther north you go, the more English is spoken, so language should not be a barrier. Note that if I did not have access to open vestibule windows, it would have diminished the experience. You might want to bring something to clean your window! And you should be prepared for mosquitos. The Québec tour group I encountered on the train from Sept-Îles also offer tours using the Senneterre and Jonquière trains. While these appear to be conducted en français, the itineraries may offer some ideas. I'd like to ride all of these trains in winter; perhaps April or May to allow for longer daylight, before leaves on trees along the line obscure the views. I hope you get the chance to experience these trains! Al is a railfan based in Vancouver. 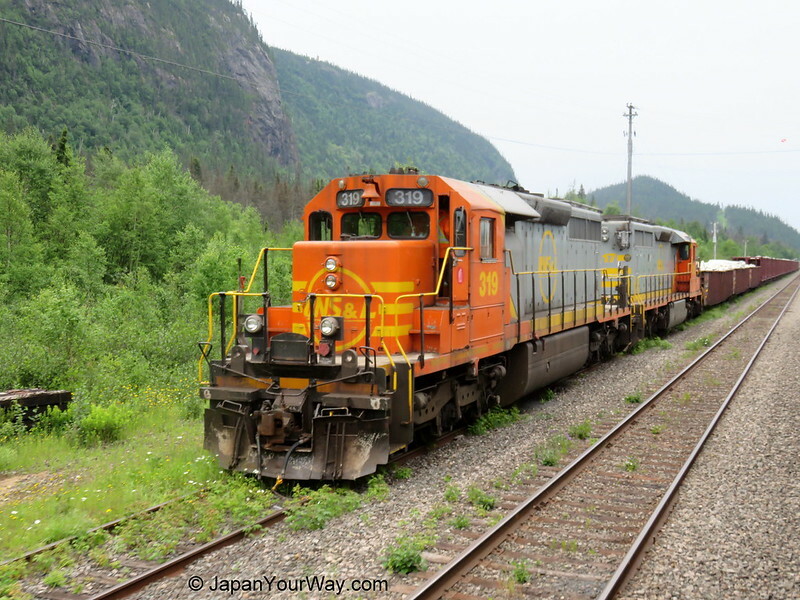 He has ridden the rails on six continents and is a guide with JapanYourWay.com offering custom tours to Japan (a great destination for railfans!) and beyond. Your accounts are refreshing updates with illustrative detail (and photos) and will be useful to inveterate travelers and rail tour operators. Thank you very much. Thank you Harry, that's what I was hoping.